Chocolate Crunchy Layer Cake decorated with chocolate mousse. Chocolate Crunchy Layer Cake 1.5 pound decorated with chocolate mousse, crunchy praline and chocolate cutouts. We use only the finest imported Belgian chocolate to make this cake. 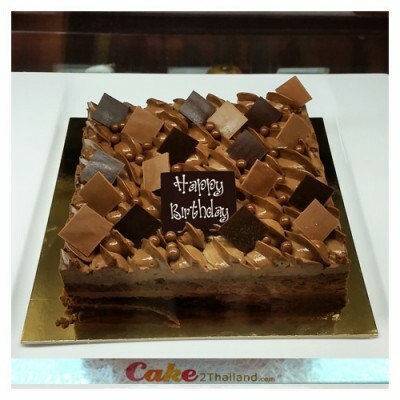 It is a special recipe from Cake 2 Thailand ® This cake is sure to be impressed. Free delivery in Bangkok. For serving 6 people. - Chocolate Crunchy Layer Cake is Only delivery in Bangkok.